A combined Competitive examination will be held for the recruitment for various posts for various departments. Written exam will be held on 24 may 2014. After the recruitment on the results of this examination will be made to be the services posts under the following categories. Its expected that time no f vacancies will be more the 600. last year notification was published for 560 posts . these recruitment will be done in Indian railway service, Railway sore, Central engineering service, Defence service, ordnance factories, CWE, CES, naval armament service , CPE , and so many other department. Selection procedure : will be based on through the written examination, and followed by a personality test. 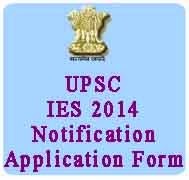 Direct link of UPSC IES exam 2014 will be published here Mexam.IN very Soon.